HONOLULU — The Hawaii State Department of Labor & Industrial Relations (DLIR) today announced that the seasonally adjusted unemployment rate for February was 2.8 percent, the same as in January. 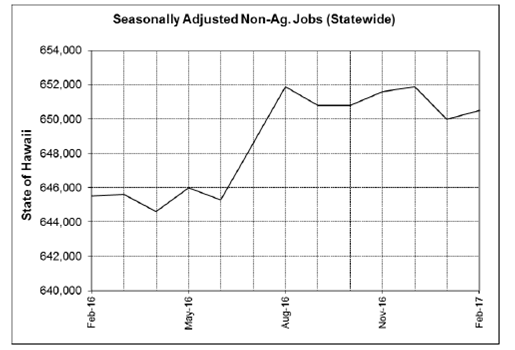 Statewide, 675,500 were employed and 19,350 unemployed in February for a total seasonally adjusted labor force of 694,850. 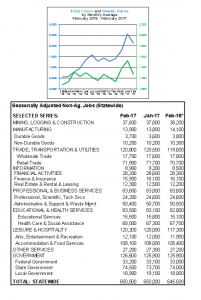 Nationally, the seasonally adjusted unemployment rate was 4.7 percent in February, compared to 4.8 percent in January. Both initial claims and weeks claims increased by 194 or 18.0 percent and 1,577 or 24.1 percent respectively for unemployment benefits compared to one year ago. Over-the-month both initial claims and weeks claims decreased by -16.6 percent and -5.0 percent respectively in February 2017. The unemployment rate figures for the State of Hawaii and the U.S. in this release are seasonally adjusted, in accordance with the U.S. Bureau of Labor Statistics (BLS) methodology. 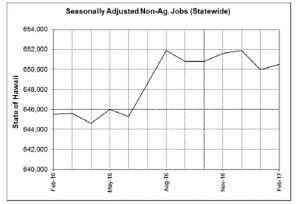 The not seasonally adjusted rate for the State was 2.7 percent in February, compared to 2.9 percent in January. In a separate measure of employment, total nonagricultural jobs increased over-the-month by 500 jobs. 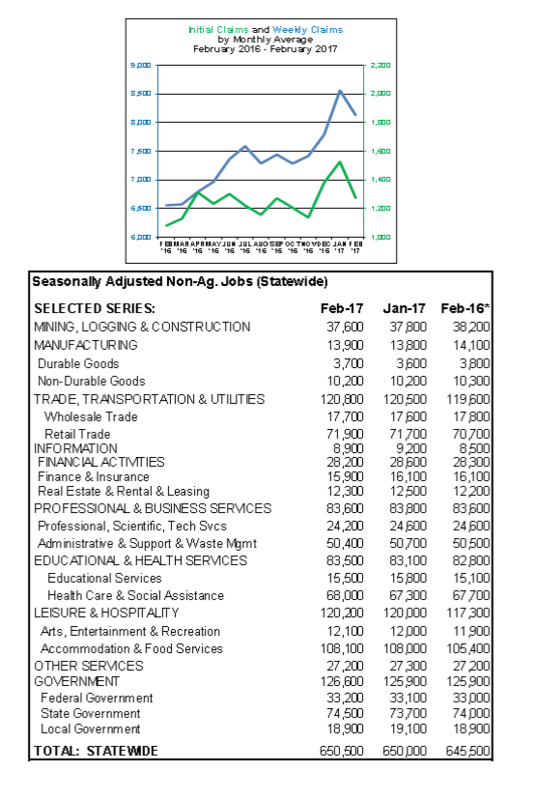 Within the major sectors, there were job gains in Educational & Health Services (+400), Trade, Transportation, & Utilities (+300), Leisure & Hospitality (+200) and Manufacturing (+100). Employment losses occurred in Other Services (-100), Construction (-200), Professional & Business Services (-200), Information (-300), and Financial Activities (-400). 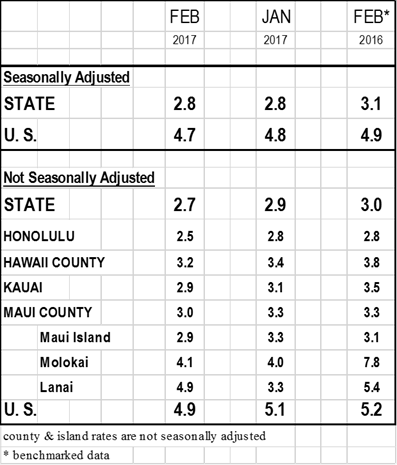 Government went up by 700 jobs, primarily in State Government within the University of Hawaii system. Over-the-year, total nonfarm employment has expanded by 5,000 jobs. Alternative Measures of Labor Underutilization for States, 2016 annual averages.